One of the stones in Pakenham mill, the site had 3 stones but it is thought the wheel was powerful enough for two, so one was spare. Only one is working at the moment, this isn't it! The top has been removed for show, the stone comes from France. Being transported in bits before being reassembled in England. Millstone grit from Derbyshire was commonly used for mill stones but was a softer rock. It ground down people's teeth, this is supported by archeological evidence. Pakenham is a unique parish in Britain, being the only one with a working watermill and Windmill in the same gridsquare! TL9369 : Pakenham Windmill. There has been a watermill on this spot since at least 1000 years when the Bishop of Suffolk, Theordred mentioned it in his will. In 1060 it was passed from Edward the Confessor King of England to the Abbey of St. Edmundsbury. The next record was the famous domesday report of 1086 which put it down as a 'winter mill'. The Abbey was the owner until the dissolution by Henry the 8th between 1536 and 1541, being sold to Robert Spring in 1545, a Suffolk clothier. The foundations of the Tudor mill are still extant and it is thought this was built around this time. 1813 saw Charles Lowe take lease of the building, as part of the lease he spent £400 (a large sum then) building the present building. Putting his initials on the 1814 datestone. It was then that the mill was enlarged, with the pond and stream height. Making the water wheel a breast shot instead of a less efficient undershot. In 1903, ownership of the mill and the farmhouse was split. By 1930 a 17 horse power paraffin engine was installed (purchased third hand from another mill) replacing a steam engine, it would power the flour rolling mill and other machinery. The site was used mainly as a livestock food production unit, being closed only during the second world war (1939-45). It ceased to be a working mill in 1974. Being purchased by the Suffolk Building Preservation Trust. It has since been restored to working order complete with tearoom. It still grinds wholemeal flour from locally grown wheat. 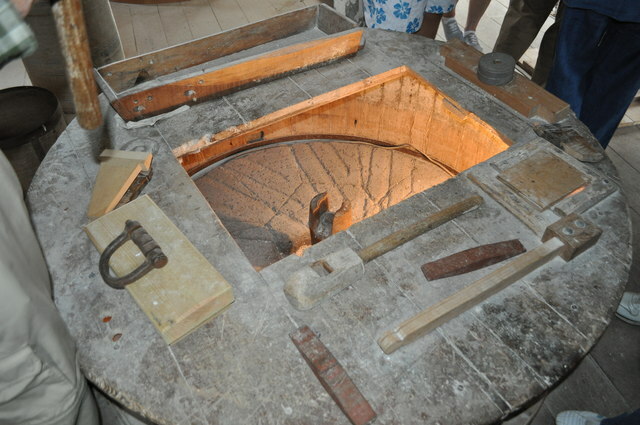 On some occasions bread is baked in the 18th century oven.